Sketch map of the Ambur valley, made from the Amburghar fort. 20 April 1792.
bl.uk > Online Gallery Home	> Online exhibitions	> Asia, Pacific and Africa Collections	> Sketch map of the Ambur valley, made from the Amburghar fort. 20 April 1792. 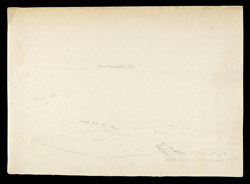 Sketch map in pencil of the Ambur valley, made from the Amburghar fort by Thomas (1749-1840) and William (1769-1837) Daniell, 20 April 1792. Ambur is located at the foot of the Kadapanathan Pass on the Palar River in Tamil Nadu in the South of India. The avidly contested hill fort on the peak of Ambur Drug dominates the town. This was the site of Muzaffar Jang’s defeat of the Nawab of Arcot in 1750 which was also the first significant battle in which European forces were used in warfare. In 1768 forces of the 10th Madras Infantry defended the fort and in 1788 Haidar Ali stormed and captured the fort, after which it was restored to British control by the Treaty of Mangalore.